We the Palestinians of the Besieged Gaza Strip, are calling on the world: enough inaction, enough discussion, enough waiting – the illegal closure on the Gaza Strip must end. While attention is focused on the Palestinian bid for statehood in the UN do not forget that the blockade and the suffering continue in Gaza. Shortly after 2006 democratic election which was supervised by people and bodies from the international community, nations formerly supporting aid and cultural organizations in Gaza withdrew their support. In mid-2007, our borders, controlled by Israel and Egypt, fully closed, locking Palestinians within and preventing imports and exports from crossing our borders. From December 27 2008 to January 18 2009, Israel waged an all-out slaughter on Gaza, killing over 1400 Palestinians, the vast majority innocent civilians and among them nearly 400 children, and destroying thousands of homes, businesses, factories and buildings including universities, schools, hospitals and medical care facilities, and damaging vast tracts of our water and sanitation system. Almost three years following after Israel’s attacks, almost no homes and few buildings have been rebuilt, our sanitation and sewage system is more dire than ever, raw waste continues to be pumped into our sea –for want of proper treatment facilities –polluting our water and the fish along the coast which fishermen are forced to harvest because the Israeli navy shoots at them if they try to fish more than three miles from the Gaza coast—contaminating our drinking water and food supply. Our farmers continue to be shot at, maimed and killed by Israeli soldiers along our border, prevented from working, growing and harvesting their land, denying us a rich supply of produce and vitamins. Nutrient deficiencies and malnutrition continue to rise, affecting our children’s growth and their ability to study. Our economy is shut down by lack of functioning factories and electricity. Our students hold little to no prospects of exiting for study abroad, even when placements and scholarships have been secured, due to the Israeli control of the Erez crossing and the Egyptian-controlled Rafah crossing being closed more often than opened. Our sick suffer for want of necessary medications and medical supplies and equipment. Since 2005, over 170 Palestinian organizations have called for Boycott, Divestment and Sanctions to pressure Israel to comply with international law. Since 2003, Palestinians have weekly met in villages in the occupied West Bank and occupied East Jerusalem, to protest Israel’s occupation policies. Creative civilian efforts such as the Free Gaza boats that broke through the blockade five times, the Gaza Freedom March, the Gaza Freedom Flotilla, and the many land convoys must never stop their siege-breaking efforts, highlighting the inhumanity of keeping 1.5 million Gazans in an open-air prison. On the 2nd of December, 2010, 22 international organizations including Amnesty International, Oxfam, Save the Children, Christian Aid, and Medical Aid for Palestinians produced the report ‘Dashed Hopes, Continuation of the Gaza Blockade’ calling for international action to force Israel to unconditionally lift the blockade, saying that despite the reported June 2010 “easing” of the closure, the Palestinians of Gaza continue to live in the same devastating conditions. Human Rights Watch published a comprehensive report “Separate and Unequal” that denounced Israeli policies as Apartheid, echoing similar sentiments by South African anti-apartheid activists. We call on the citizens of the world oppose this deadly, medieval blockade. The failure of governments and world bodies to condemn such crimes is tantamount to complicity. Only civil society is able to mobilize to demand the application of international law and put an end to Israel’s impunity. The intervention of civil society was effective in the late 1980s against the apartheid regime of South Africa. Nelson Mandela and Archbishop Desmond Tutu have not only described Israel’s oppressive and violent control of Palestinians as Apartheid, they have also joined this call for the world’s civil society to intervene again. We call on the nations and citizens of the world to continue and/or reinitiate their plans to sail to Gaza to challenge and break the Israeli blockade. The civil society initiatives of the Freedom Flotillas are about taking a stance of justice and solidarity with besieged Palestinians when your governments will not. We call on the Flotilla movement to continue to sail until the blockade of Gaza is entirely lifted and Palestinians of Gaza are granted the basic human rights and freedom of movement citizens around the world enjoy. Signed by: University Teachers’ Association, Palestinian Nongovernmental Organizations Network, Al-Aqsa University, Palestine Red Crescent Society in Gaza, General Union of Youth Entities, Arab Cultural Forum, General Union for Health Services Workers, General Union for Public Services, Workers General Union for Petrochemical and Gas, Workers General Union for Agricultural, Workers Union of Women’s Work Committees, Union of Synergies—Women Unit, Union of Palestinian Women Committees, Women’s Studies Society, Working Woman’s Society, Palestinian Students’ Campaign for the Academic Boycott of Israel, One Democratic State Group, Palestinian Youth against Apartheid, Association of Al-Quds Bank for Culture and Info, Palestine Sailing Federation, Palestinian Association for Fishing and Maritime, Palestinian Women Committees, Progressive Students Union, Medical Relief Society, The General Society for Rehabilitation, Afaq Jadeeda Cultural Centre for Women and Children, Deir Al-Balah Cultural Centre for Women and Children, Maghazi Cultural Centre for Children, Al-Sahel Centre for Women and Youth, Ghassan Kanfani Kindergartens, Rachel Corrie Centre – Rafah, Rafah Olympia City Sisters, Al Awda Centre, Rafah Al Awda Hospital, Jabaliya Camp Ajyal Association, GazaGeneral Union of Palestinian Syndicates, Al Karmel Centre, Nuseirat Local Initiative, Beit Hanoun Union of Health Work Committees, Red Crescent Society Gaza Strip, Beit Lahiya Cultural Centre, Al Awda Centre – Rafah, Al-Quds Bank for Culture and Information Society, women section -union of Palestinian workers syndicate, Middle East Childrens’ Alliance -Gaza, Local Initiative -Beit Hanoun. Sadly the Palmer/Uribe Report on the May 31, 2010 Flotilla Incident, leaked to the New York Times on 1 September, is an expected whitewash of Israeli crimes. While it blames Israeli forces for using excessive force when they raided our Gaza-bound civilian ships, it erroneously justifies Israel’s blockade of Gaza, casts doubts on the intentions of the flotilla organizers, and does not seek accountability for perpetrators of human rights abuses. Well where do I start, I know it’s been several weeks since my last post – but I’ve been a little pre-occupied with a wall of bureaucratic obstacles and a possible prison sentence. Anyway I digress, let’s go back to the start and I can bring you up to speed on what has been one of the most amazing months of my life – even if it did contain some of the scariest moments of I ever experienced. 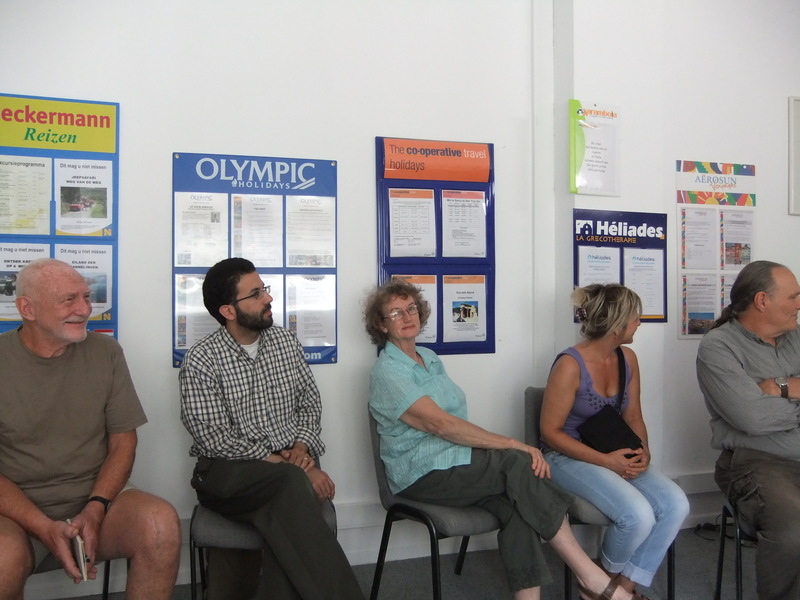 So we started off in Crete at the port of St Nicolas, as the ABCD tour group – as we were mainly made up of members from Australia, Belgium, Canada and Denmark – the most diverse and unorganised tour group in the history of tourism. Diverse, aged from 23 to 80, students to retired politicians, 10 nationalities represented [yes Manon and Mary-Eve – I am including Quebec in that count] and more opinions than people. Unorganised, well at least it would have looked that way from the outside – we were constantly meeting in a small meeting room to discuss “outings” that kept getting postponed, our room bookings changed on a daily basis and the next stop on our tour changed every time we were asked. While discussing the group I must admit that I am not a people person – put me in a room with 50 people and generally I might like 5 of them, if your lucky. 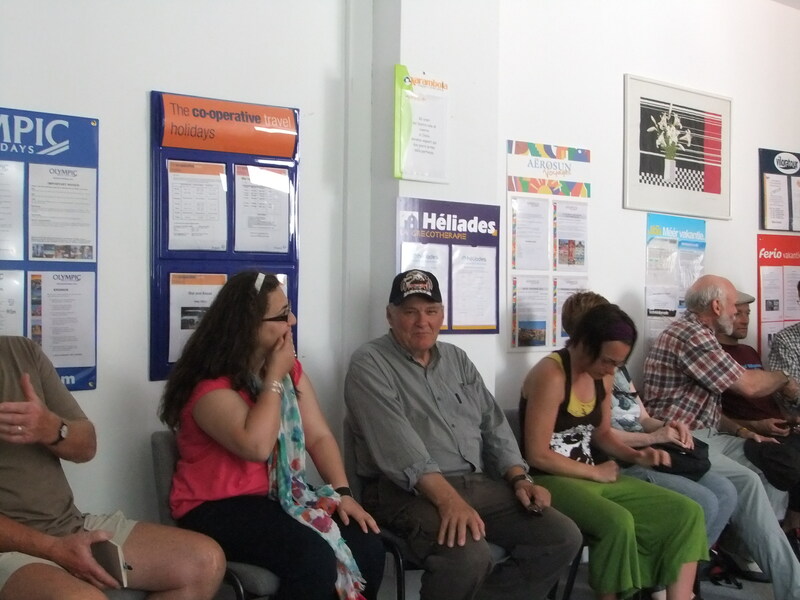 However of the 50 participants of the ABCD tour group, or the “Tahririans” as Amira Hass has dubbed us, I respected and liked everyone involved – almost feeling out of place at times, for example while sitting around discussing wealth distribution with Bob Lovelace [1st Nations Chief] Sylvia Hale [former member of parliament] and Sue Breeze [a 30 veteran of peace and justice struggles]. For the impressive back stories of the “Tahririans” click here. The four days of training that we undertook were designed to bring us together as a group and help prepare us for the challenges that lay ahead. Ladder Climbing Lee [LCL], we had to give ourselves a prefix to our first name that described you and started in the same letter as your first name – I was Manic Michael, anyway LCL facilitated most of the four days and I have to say was the best facilitator I have ever seen – and I have seen a few facilitators as I organise training for my day job. It was beautifully structured, invigorating and it pushed you, and all in a hot, overcrowded room, with minimal props – just LCL , some butchers paper and a few textas. So let me set the scene we have all spent the last 6 to 12 months working and preparing to sail in uncertain water, to put it lightly. We have now just finished four days of training, that involved discussing some pretty heavy scenarios – how we would be boarded – where you wanted to be during the boarding – how long you were prepared to stay in detention before signing the Israeli deportation order admitting you “acted illegally”, i.e. that the siege of Gaza and the collective punishment they is enforce is legal. While I know answering these questions pre the event only gave an indication of how you would like to carry it, but speaking personally, it help me solidify a process I had started months before. So you getting the picture, we were up for it, where ready to roll – then we got our first paper cut. Each day at the start of training Decisive David would give us an update in regards to timeline, tasks, and possible obstacles. As the training was coming to an end the obstacles began taking up more and more of the update – it seemed every time we fulfilled one of the INSB or Harbour Master requests, they hit us with two more. For instance at one stage the INSB had spent all day inspecting our boat, a regular occurrence, they discovered that the emergency beckon while it gave our correct position it identified the ship under its previous name and that the benches were not wide enough to be used as beds. The radio was replaced in half an hour and shortly there after we were demanding to see where in the regulatory guide it specified the width at which a bench can be used as a bed. Strangely they could not find that regulation in the book, but by the time that was figured out – we now needed a representative of the Comoros Islands, whose flag we were sailing under, to confirm that the representative that signed the first document was actually a representative of the Comoros Islands, no really! Keeping in mind we had already passed all the relevant inspections prior to requesting to sail to Gaza, only then were they “concerned for our safety”. The other interesting point is that before we bought the Tahrir it did Island cruises between different Greek islands, without any concerns about its sea worthiness. Since we had bought the boat we had spent thousands on improvements to the engine, putting in larger water tanks and better communications equipment – yet now they were worried about its sea worthiness ??????????????????????????????????????????????????????????? So you’re with me, we were starting to get the sense they might not let the Tahrir leave Greek waters – people are starting to postpone flights home at ridiculous costs, hotel bills are adding up and all this at personal expense and on top of cost already incurred – some of us, me included, hoped Israel would deport us back to home countries rather than the other options of Athens or Amman. Well, if we got that far there was a good chance that the Tahrir would be impounded never to be seen again, so a flight home was not asking to much ; ] This tension built up for several days until two days after training had finished – while we were not training, we were still meeting at least twice a day to work on strategy, media and web presence. We received the news that the Swedish, Norwegian and Greek cargo ship that was part of the flotilla had had its propeller drive shaft cut and there was no doubt it was an act of sabotage. We immediately went to a 24 hour security roster and installed under water lights to increase night-time visibility. While there had been speculation about the level of surveillance we were under – this was the first piece of solid evidence we had that Mossad was in town, towards the end when they had fallen into certain patterns of surveillance we realised how much surveillance we were under – although our Greek comrades knew the whole time, insisting that during meetings all phones not only had to be off – but have the batteries removed as well. Well it was becoming clear that our attempt at subtlety was not getting us anywhere, maybe it was time to change up? But before we had a chance the Harbour Police turned up and demanded our ships log, which Sandra Ruch refused to give it up, stating “If you take the log, you take me with it” – much respect, Sandra. 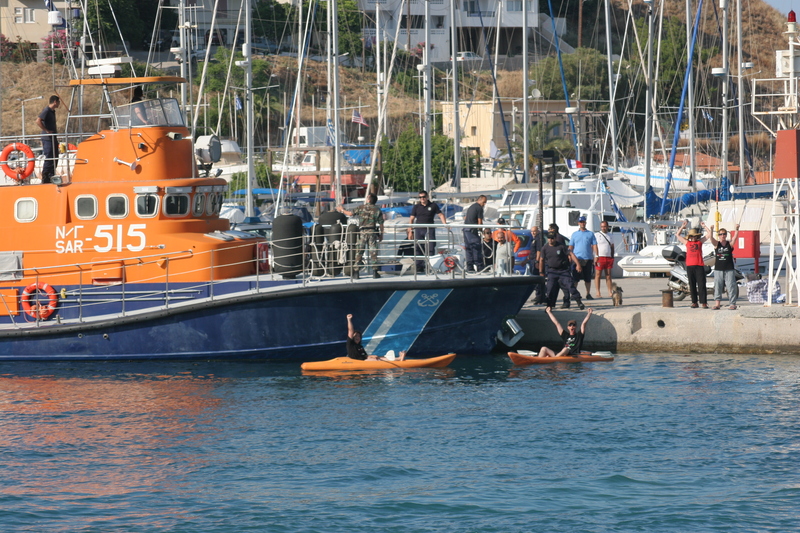 The Harbour Police’s indecision gave us enough time to mobilise and get enough bodies on to the boat so that taking Sandra with the log was no longer an option. When we came out, I must say, it was one of the most liberating experiences of my life. 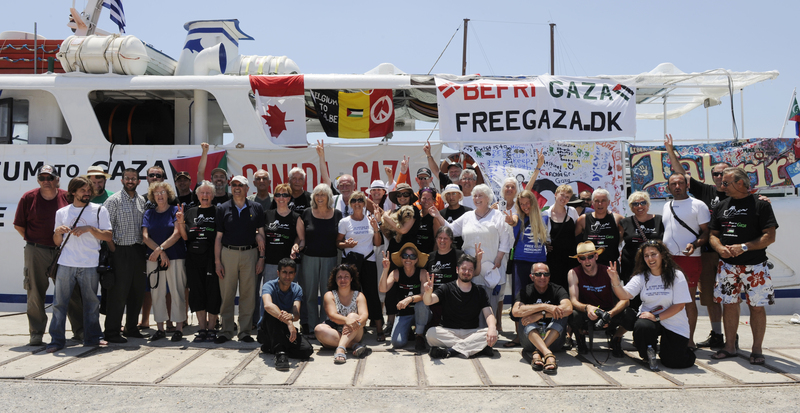 We were no longer the ABCD tour group, we where part of Freedom Flotilla 2 – Stay Human. We dropped our banners and did what we do best: PROTESTED INJUSTICE. We quickly organised a march through the streets of St Nicolas to the Harbour Masters office, if she wanted the log she could have it along with us and a long list of queries about why the blockade of Gaza had been extended to European waters and questions about under whose authority was this done ? While on the march we chanted and danced, alivened by the fact we could now openly express ourselves. Unfortunately the joy was short-lived, once at the Harbour Masters office it became clear that the Greeks had run out of bureaucratic hurdles and instead slapped a ministerial edict on us, stating that “No ship bound for Gaza could leave Greece”. The last of the 1000 paper cuts, or as fellow Tahririan Miles Howe described it “Where like a peaceful elephant getting taken down by a wild pack of hyenas – painfully and slowly being ripped apart”. But this elephant was not out for the count yet, we decided to move on to the boat – the Tahrir was now home : ] Moving to the boat not only made it less likely we would suffer the same fate as the Swedish-Norwegian-Greek cargo boat, but it also lifted our spirits, giving us sense of progress. However this again did not last long and just when I was ready to re-name the flotilla “ready, steady – NO” news comes through that we were going to challenge the extension of the blockade of Gaza to European waters by leaving port without permission from the Harbour Master. Only problem was since we had come out, we had a coast guard boat moored next to us. So bags packed, all aboard, but how are we going to get around the Coast Guard boat? Then Soha, who I had become already quite close to due our nocturnal lifestyles, comes up to me and asks whether I can help her out. She had been asked earlier in the day whether she would give up her spot on the boat to help the Tahrir get out of port, but she needed a partner in crime – I told Soha that I would do it, but needed to let some one from the Australian delegation know – so I could hand over the communication role and equipment. Soha said that no else could know, and that she would try to find some else, personally I thought phheeewwww! However an hour later Soha still has not found her partner in crime and tells me I’m in – I quickly grab Nick and bring him up to speed with the satellite phone, grab my gear from the boat and rush it back to Soha’s hotel room. At this stage I must admit I had mixed emotions, I had spent the last year organising and fundraising to get to this point – then just before we get to the second last hurdle, I‘m out. On the way back to the hotel I discover that we are going to position ourselves in front of the Coast Guard boat in kayaks in order to stop them blocking the Tahrir in port, we decided on a strategy and race back top the Tahrir. Once back on board Soha and I start to prepare, familiarising ourselves with our equipment and trying not to show the emotion that was welling up inside – for me at least. Then the call came to get into the kayaks, at first we just played around splashing each other – and even though Soha won’t admit it, I won – we then slipped around the side of boat where the Coast Guard could not see us, waiting for the Tahrir to start its engines – which was our signal to go. We waited for what seemed like an eternity, then the engine roared into life – game on. Much to my surprise we had caught the Coast Guard off guard and made it to the bow of the Coast Guard boat unopposed, once in position I started to think “maybe it would have been better that they did see me paddling into position – what if in their panic they take of without realising where here”. Then much to my relief the Coast Guard begin to shout at us to move, trying to kick us off our kayaks while lowering themselves down to water from both the boat and the dock, even using their fender to shoo us a way like flies. We mange to obstruct the Coast Guard long enough for the Tahrir to get out of port, with almost a five minute head start. What now? As Soha and I looked at each other, neither of us thinking we would get this far and thus had not planned our get away – LEG IT! Or in this case, paddle for it. We paddled out of port and headed to beach landing around the corner, the whole time focused on Tahrir and its dash for the deep water shoot – “Go the Tahrir, show the world the lengths Israel will go to – to stop humanitarian aid – and hopefully have the world ask: why?” As we approach the beach we realised there was a reception party awaiting our arrival, we tried to paddle for another beach, but soon realised that we were done – we came ashore with our hands up stating that we were peaceful protesters and that we were no threat. Soha and I were immediately cuffed and transported to the Harbour Masters office. Where we were separated and left cuffed in our wet cloths, listening to our future being discussed in raised voices and a foreign language. After an hour or so, John Turnball – not sure what John’s prefix from training was, but if I had to come up with it, it would have been Joyously Technical John. As James Brown would say “John was the hardest working man in St Nicolas” – anyway John brought Soha and I dry clothes, which we were allowed to change into – un-cuffed, but supervised. A short time later we were un-cuffed to eat, and this time the cuffs stayed off. That night we spent at the Harbour Masters office, I later found out that staff did unpaid overtime to keep us out of the cell’s in Napoli, and after seeing those cells while waiting to see the District Attorney the next day, I am forever in their debt. Later that night, Sandra who had been down to see us several times throughout the evening, came back to Harbour Master’s office and was arrested – as the ship’s owner. This was because there been a “I’m Spartacus” moment on the boat post its boarding, with all 35 crew stating that they where the Captain – keeping in mind the experience of the American Flotilla boat, “Audacity of Hope”, where the only person arrested when it made its dash for open water was the Captain – OH Captain, my 35 Captains. That night was either my first night of renewed freedom or my last night of freedom for a while – so either way it was party time – maybe not the smartest option. Court was scheduled for 12.30pm the next day, so we had to be there 11.30am – which meant leaving St Nicolas around 10.00am – after a few coffees I was fine. Again there were long delays in Napoli and before the AC was turned on I felt like I was about to faint – a funny story in quite a serious situation, while waiting for the Judge the Tahrir three Sandra, Soha and I all received massagers from our fellow Tahririans, tell me again “why was Israel so scared of us”? Oh right, we’re the only threat to their continued impunity from international law – unfortunately there were no cameras allow in court. As for the court case, it was like a Sydney horse race, the fix was in. From the get go it was clear the DA, who we already knew was not part of the international solidarity movement, and the Judge, we’re on the same team. On the evidence before the court – some very considered testimonies by the Coast Guard and Harbour Police – our own testimonies – and some impassioned arguments from our lawyers – I started to think we might, just maybe, be in the clear – although that impression came second-hand from a court employee’s interpretation. Still I was taken aback when we were asked to stand, one by one, and convicted, one by one, to 30 day sentences. Then we were asked if we had ever been convicted before, “No you Honour” – SENTENCE SUSPENDED – that was longest five minutes of my life. Post-court and post several beers, Decisive David sidles up to me and asks, “When is your flight home?” – “I don’t have one” – “Good, this is not over yet !” – the roller coaster continues. So news has come through that some flotilla boats in Greek ports had changed tact and are now requesting to sail to ports in Turkey and Egypt – with some success. So for the next few days we rode the roller coaster, having several meetings that would possibly inform us we were free to leave Greek waters. At first I was trying to convince myself that I could bring my self back up for a last lunge toward the line, but eventually – knowing there was a chance of being deported back to Greece to serve at least my 30 days in general population – I decided to jump ship and join the home team – where I would mind luggage and post it to where ever my fellow Tahririans where deported to. I know that I let a few of you down with this decision, butI was happy that I had realised my limits – something I generally struggle with. 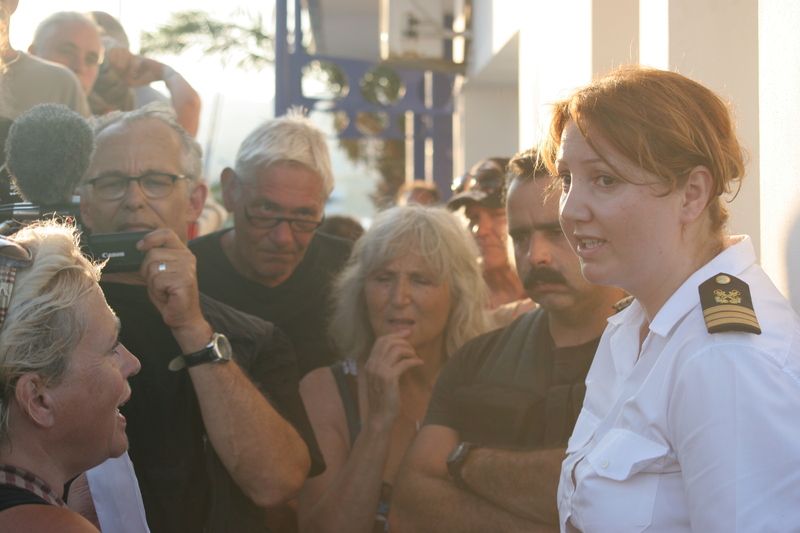 Unfortunately the bureaucratic wall held firm and the Tahrir is still in the port of St Nicolas in Crete – however, because of some of the most committed people I have ever met, the story continues. Firstly, Sylvia and Vivienne decided to join the “Welcome to Palestine” or “Flytilla” imitative – flying to Tel A Viv and stating at customs “I am here to visit Palestine” – this was a short notice call to arms that was impressively responded to, resulting in over 100 people taking part. 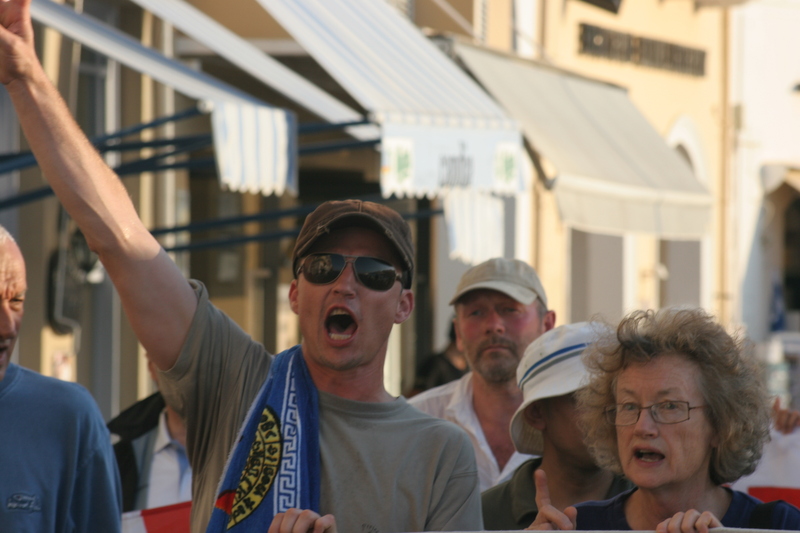 Some were stopped in their home countries, such as France, where several French nationals were not allowed on flights bound for Tel A Viv – but the majority made it to Tel A Viv and were detained and were awaiting deportation. Not Vivienne and Sylvia though, they appealed their deportation orders and won, setting a legal precedent in Israel. The Flytilla was effective on two fronts – it showed the isolation of Palestinians living under occupation, even convicted criminals get visitation rights – but it also showed that like Greece, France could also be pressured into denying its citizens basic rights to appease Israel and the US. Then Stephan from the steering committee, and Amira, a journalist, get themselves on the Dignity, the French boat that sailed from Corfu. 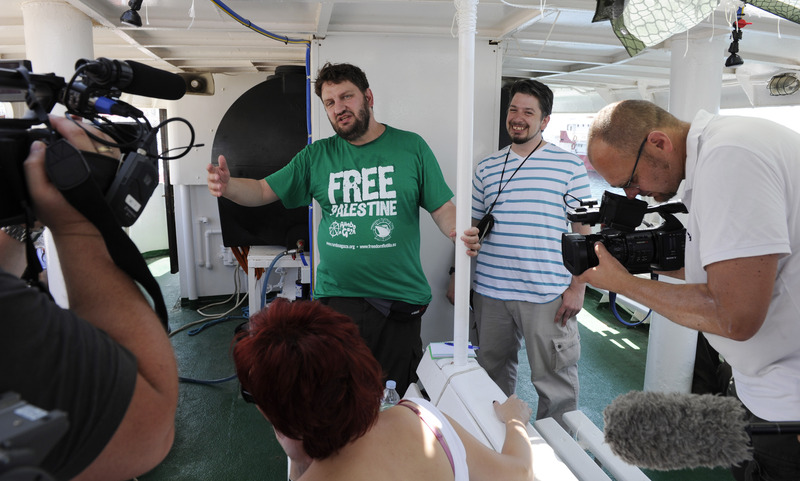 The only member of Freedom Flotilla 2 to challenge the Israeli imposed blockade of Gaza. 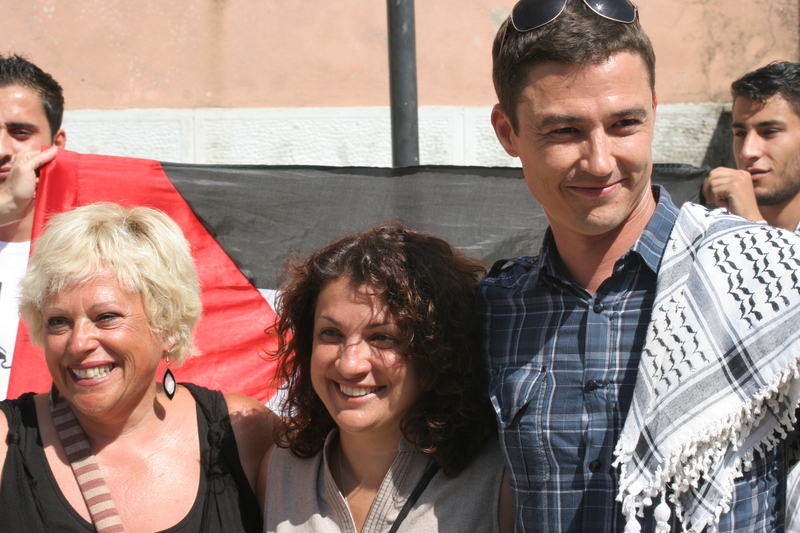 Much respect Vivienne, Sylvia, Stephan and Amira – after three weeks on the emotional roller coaster that was Freedom Flotilla 2, I was emotionally and physically spent, but you marched on and it’s a privilege to know people like you. Well that’s my story, so far, but before I sign off I would like to publicly acknowledge the Sydney working group – Vivienne, Rihab, Raul, Adam, James and Sylvia – for their vision and commitment. 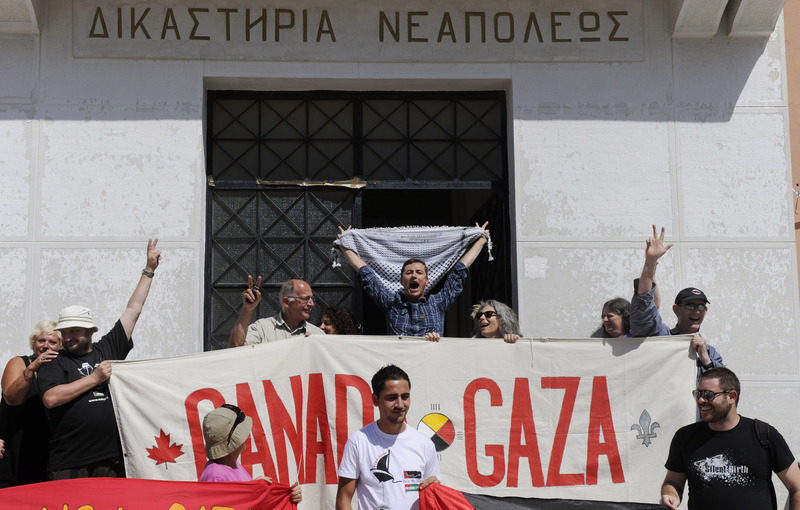 The Canadian Boat to Gaza steering committee, your leadership and inclusive decision making was greatly appreciated. Lastly, to all my fellow Tahririans it was a privilege and an honour to serve with you, and I am looking forward to seeing you all in foreign port somewhere in the not too distant future. * All photos courtesy of Jim Rankin -Toronto Star – and Miles Howe – Halifax Media Coop – Cheers guys. For several weeks now, our army and navy have been in a state of high alert, bravely facing a deadly threat to our very existence: ten little boats trying to reach Gaza. These vessels are carrying a dangerous gang of vicious terrorists, in the form of elderly veterans of peace campaigns. Binyamin Netanyahu has affirmed our unshakable determination to defend our country: We shall not let anyone break the blockade to smuggle rockets to the terrorists in Gaza, who will then launch them to kill our innocent children. This is a kind of record even for Netanyahu: not a single word is true. The flotilla is not carrying any weapons – the representatives of respected international media in the boats provide assurance of this. Also, I think we can rely on the Mossad to plant at least one agent in every boat. (After all, what am I paying my taxes for?) Hamas has not launched rockets for a long time – it has very good reasons of its own to keep the unofficial “Tahdiyeh” (“Quiet”) agreement. If the flotilla had been allowed to reach Gaza, it would have been news for a few hours, and that would have been that. Israel’s total mobilization, the training of the naval commandos for capturing the boats, the acts of sabotage carried out in Greek ports, the immense political pressure exerted by Israel and the US on the poor, bankrupt Greek government – all this has kept this minor initiative in the news for weeks now, drawing attention to the blockade of the Gaza Strip. What is this blockade for? There is no ascertainable reason for it now, if there ever was one. To terrorize the Gaza people into overthrowing the Hamas government, the victor in democratic elections? Well, it didn’t work, did it? To compel Hamas to change its terms for a prisoner exchange which would release Gilad Shalit? That didn’t either. To prevent the smuggling of arms into the Strip? The arms are flowing freely through a hundred tunnels from Egypt, if we are to believe what our army tells us. So what purpose does the blockade serve? Nobody seems to know. But it is the rock of our existence. That much is clear. As a result of world pressure following last year’s flotilla, the blockade was eased considerably. But Gaza manufacturers are still prevented from getting their products out of the Gaza Strip – thus condemning most of the population to unemployment and abject poverty. The same goes for the disgusting trade in human remains. Netanyahu promised to turn over the remains of 84 “terrorists” (both Fatah and Hamas) to Mahmoud Abbas as a gift. At the last moment, he reneged. His people make believe that these remains, by now hardly identifiable, may serve as bargaining chips in the game for releasing Gilad Shalit. 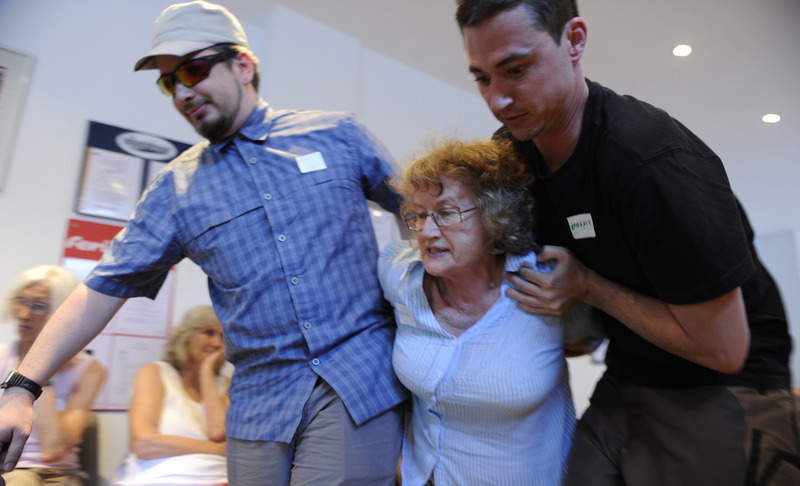 The same goes for the actions against yesterday’s fly-in of international peace activists though Ben-Gurion airport. All they wanted was to go to Bethlehem and Gaza, which can only be reached by crossing Israeli territory. Almost a thousand police officers were mobilized to meet that threat. All of these unthinking knee-jerk reactions: We must be strong. Everywhere there lurk mortal dangers. Israel must defend itself. Otherwise there will be a second Holocaust. THIS IS an interesting phenomenon: people see innocent-looking elderly human-rights activists on their TV screens and believe they are seeing dangerous provocateurs, because the government and most of the media tell them so. Sinister “Arab and Muslim” individuals are hiding in the boats. An Arab American on one boat has been unmasked as somebody who has collected money for a Hamas social institution. A dangerous terrorist! How absolutely awful! The phenomenon of people seeing something and thinking they are seeing something else has always intrigued me. How can people not believe their own eyes but believe the eyes of others? This week I got an e-mail message from a man who remembered something from the time he was a pupil of my late wife, Rachel, in first grade. Rachel asked him to raise his right hand. When the boy did so, Rachel said: “No, no. That is your left hand!” She turned to the other children and asked them, which hand it was. Following their teacher, they shouted in unison: “The left! The left!” Seeing this, the first boy started to waver. In the end he conceded: “Yes. It is the left hand.” “No, you were right in the first place,” Rachel assured him. “Let this be a lesson to all of you: if you are sure that you are right, insist on it. Never change your view because other people say the opposite.” Quite by chance, straight after reading this testimony, I saw on TV the results of a scientific investigation by Israeli researchers into “instilled memory”. Their experiments show that people who have seen something with their own eyes, but are told by everybody else that they have seen something else, start to suppress their own memory and “remember” that they saw what the others had allegedly seen. Neurological research then showed that this is can actually be seen happening in the brain: the imagined memory replaces the real. Social pressure has done its work: the instilled memory has become real memory. I believe that this is even truer for an entire nation, which is, of course, composed of individuals. I have seen this many times. For example, for 11 months before Lebanon War I, not a single shot was fired from Lebanon into Israel. Against all expectation, Yasser Arafat had succeeded in enforcing a total cease-fire even on his Palestinian opponents. Yet after Ariel Sharon started the war, practically all Israelis clearly “remembered” that the Palestinians had shot across the border every single day, turning life in Israel into hell. I call this “Parkinson in reverse” – while advanced Parkinson patients do not remember things that happened, these patients do remember things which never happened. There is a mental disorder called “paranoia vera”. Patients adopt a crazy assumption – e.g. “everybody hates me” – and then build an elaborate structure around it. Every bit of information which seems to support it is eagerly absorbed, every item that contradicts it is suppressed. Everything is interpreted so as to reinforce the initial assumption. The pattern is strictly logical – indeed, the more complete and the more logical the structure, the more serious is the disease. Among the accompanying symptoms are belligerent behavior, recurrent suspicions, disconnection from the real world, conspiracy theories and narcissism. It seems that whole nations can fall victim to this illness. Ours certainly appears to have. It has been said that paranoiacs also have real-life enemies. The trouble is that the paranoid by their offensive and distrustful behavior, create more and more real-life enemies. The slogan “All the world is against us” may easily function as a self- fulfilling prophesy. Israel is not the only country to suffer from this affliction. At some time, the Germans have been afflicted. So have the Serbs. So, to some extent, has the US and many others. Unfortunately, the costs of paranoia are very high. So let us start to behave like sane people. Let the little boats go to Gaza. Let arrivals at Ben-Gurion airport go to the Palestinian territories and pick olives, if that’s what they want. Even if we do behave like a normal nation, Israel will continue to exist. Really! Article by Uri Avnery July 9, 2011. Death by a Thousand Papercuts? This post is by Miles Howe, words and photograph – Miles is one of the most optimistic men I have ever meet, not to mention his wicked sense humor and commitment, and I still hope to sail to Gaza with him in the near future. The Greek government has crumbled in the face Israeli pressure, and has issued a ban on the sailing of all Freedom Flotilla II boats to Gaza. 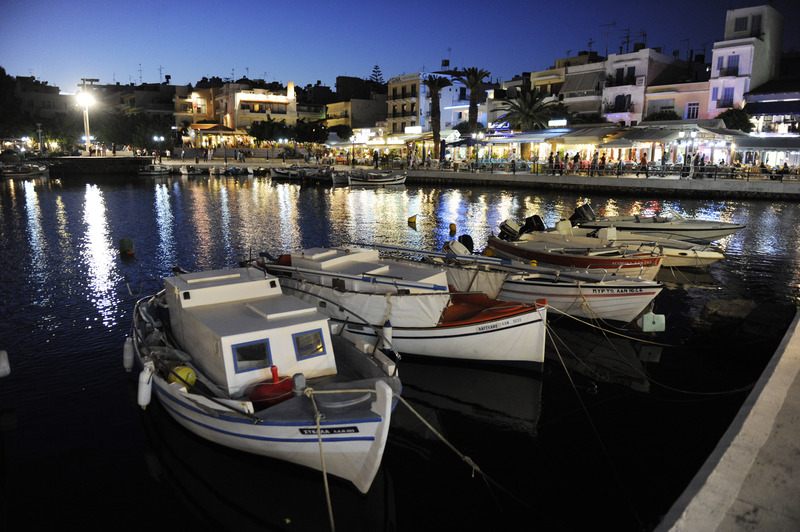 The Canadian Boat to Gaza, the Tahrir, sits in a marina in Agios Nikolaos. It is unwilling to stay, but unable to go. Its banners of hope are now unfurled and draped over its sides, and it presents a striking counter-balance to its harbour mates of pristine tourist yachts. 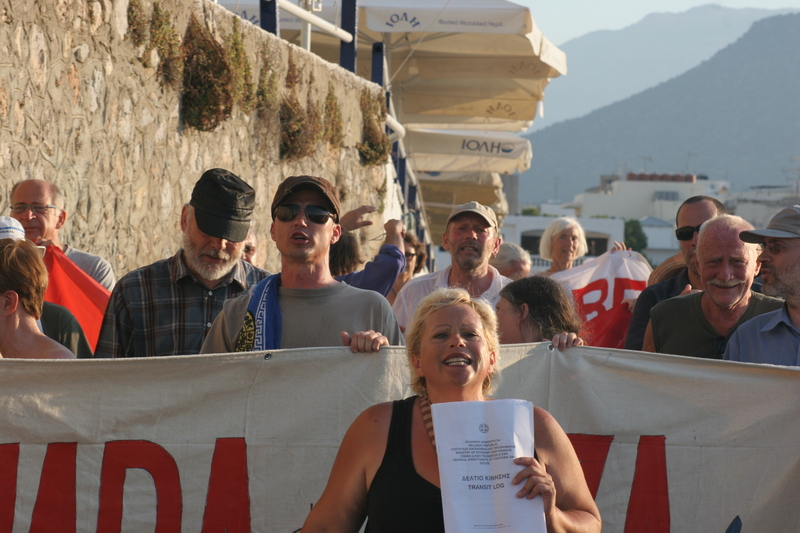 Yesterday, the peaceful activists that make up the Tahrir’s crew protested the injunction against their boat, and marched through the streets of Agios Nikolaos, from the marina to the harbour police office. There, they were again stonewalled by a wall of red tape. Any and every reason for finding the Tahrir unable to sail were found, from inadequate bench length, to lack of warm water, to an improper radio signal. Today, the Flotilla appears to have been dealt a very serious blow. 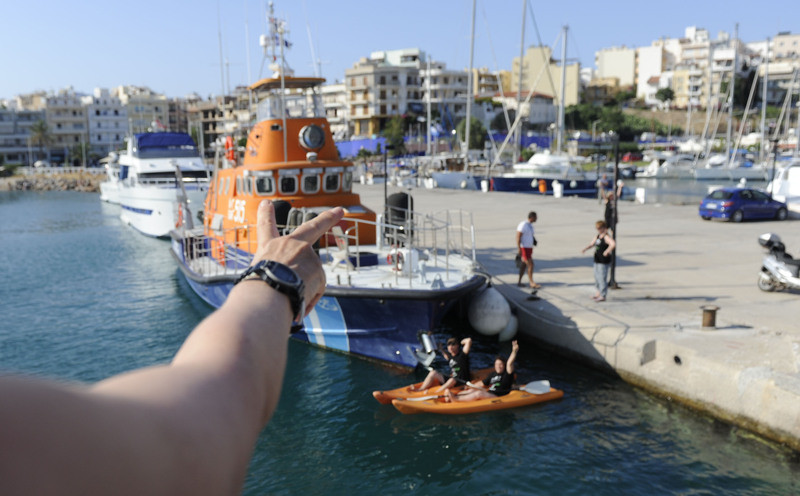 All boats save the French Dignite, which sailed out of Corsica, were hoping to sail from Greece. Political contacts that were expected to allow this to happen were sadly absent in the face of Israeli governmental power. The legality of this action by the Greeks, who are the EU’s main importer/exporter, is in question, and brings to doubt Greece’s safety and sovereignty as a place to do shipping business of any kind. Such matters are for the courts, and we must wait for the work week for the legal implications of what the Israelis and Greeks have done to begin to unfold. The Israeli government has succeeded in not allowing the boats, for the moment, to sail. On the other hand, many consider that Israel has failed miserably in keeping the world’s eye, and one would hope conscience, from the larger issue of the continued imprisonment of the Palestinian people. People from around the world now wonder why Gazans remain captives in their own state, why they cannot access their coastlines and sail freely, why they cannot visit the West Bank, and why the world cannot visit them and do trade with them. It is clear that the ‘Arab spring’, indeed the human spring that must take place, will not forget Gaza, and will not come to fruition until Palestine is free. Sylvia Hale and I venting our frustration at the Zionist Greek Government ! Well as sit here in my hotel room suffering through a cold, which has finally caught up with me : / I think the adrenalin has keep it at bay for the last couple of weeks and with our latest delay it has given it the opening it needed. I wanted to let you know about all the hurdles that Israel is trying to put in our way and on a certain level I take as a compliment. Apart from the diplomatic efforts to deter us, through the UN and pressure on our respective embassies, there has been a series of events that would be more at home in a spy novel than my life – the machinations behind attempts to stop this flotilla sailing have been incredible to watch from up close. Firstly at least two of the boats in the flotilla have had complaints made against their sea worthiness, the US boat “The Audacity of Hope” and our boat the “Tharir”. The Israeli Law Centre has made these complaints as not a way to stop us, as both boats had already passed the relevant inspections, but most likely a way to slow us down and prevent us all from sailing together – making their job of intercepting and boarding us easier. In addition to this the Swedish, Norwegian and Greek boat has had its propeller drive shaft cut, in another attempt to minimise the number of boats in the flotilla. Hopefully this will only take two days to fix but with the strikes and chaos in Greece at the moment maybe longer. We have put extra precautions in place to stop the same faith be falling the “Tharir”. Then at this morning briefing we were informed that a number of flotilla participants in Athens had been mugged and their phones stolen – only, in an effort to infiltrate our communications. Not to mention all the pressure that the US/Israel is putting on any country where we will be sailing from to not let us sail – through their own diplomats and other international institution that they control. All this as mentioned earlier is on one level a compliment to the international solidarity movement, we are now setting the agenda, with the Nakba protests demanding the right of return for the Palestinian refugees, with the global effort to impose a strategy of Boycott, Divestment and Sanctions on Israel until it abides by international law and of course the flotilla which aims to challenge the illegal blockade of Gaza and the collective punishment it enforces. Open letter by Robert Lovelace, who is an Algonquin presence with the Freedom Flotilla. There is an unwritten rule that Aboriginal people in Canada should not take our grievances with Canada outside of national borders. Most of us have grown up to respect the principle of “keeping it in the family,” so to speak. Voluntarily agreeing to not think and act internationally creates boundaries that restrict our own understanding of colonialism and the political mechanics that continue to undermine Aboriginal self-determination. Ignoring the suffering that colonialism brings to others will only prolong our own. This month, I will be joining the Freedom Flotilla to Gaza, an international fleet of seven ships delivering food, construction and medical supplies to the besieged people of Palestine. I am not going as a representative of my First Nation community or any organization. This was a personal decision after discussion with and support from my family. We recognize that the people of Palestine have been subjected to colonization in the same way that Indigenous people here have lost their relationship with the land. Gaza has become an open-air prison for 1.4 million people. It is the largest “Reserve” in the world. Finding solutions and reconciliation begins by getting involved. So why should Indigenous people in Canada bother with people in other countries? I once offered a young man in our community a copy of Steve Biko’s book, I Write What I Like. He handed it back and said, “what does a n****r in South Africa mean to me?” Biko understood a lot about Indigenous identity and how colonial States control what people think of themselves. Biko also understood how Indigenous people are forced onto reserves and come to believe that a few square kilometres are all that they will ever know of a homeland. Martin Luther King, Gandhi, Nelson Mandela, Tecumseh, Pontiac, Powasson all struggled against the effects of colonialism. Colonialism is an international scourge that has destabilized all of humanity not only our own cultures. We have much in common with people around the globe who have been displaced and written off as acceptable casualties of progress. The United Nations has declared Israel’s blockade of the Palestinian port at Gaza to be illegal. But, still, Canada and other developed nations continue to turn a blind eye to Israel’s military control and the suffering of the ordinary people of Gaza. Foreign Affairs Minister John Baird has called the Freedom Flotilla “provocative.” While the effort to bring humanitarian aid is essential, the political effort of challenging the criminal isolation of 1.4 million people is just as important. If our ancestors and their supporters had not challenged residential schools, the theft of traditional territory and resources, and sought meaningful relationships through treaty we would not have survived to be Anishnabeg today. Many communities are still overrun by extractive industries or positioned as impoverished resource warehouses of this country. We need to think and act beyond the scope of government policy initiatives because Canadian international actions toward indigenous people elsewhere are instilled with the same racist and privileged ideologies that are expressed at home. Surely there is a better way to make a living in this world. Those of us who have chosen to board the Canadian Boat in the Freedom Flotilla expect to succeed. We will either succeed by bringing much needed medical supplies to civil society groups in Gaza or we will succeed in bringing worldwide attention to the cruelty of colonialism. All of us accept that this is a dangerous voyage and have agreed to be non-violent in words and action. This is not about condemning one side or the other, or supporting one political group over another. It is about providing aid and challenging a corrupt and inhumane practice. Even though the Canadian Boat will be fully inspected by a neutral third party there is a real potential that we will come under attack. My hope is that you will think beyond the confines of our own colonial cage and counsel the Canadian government to ask for restraint, acceptance and peace from the Israeli government. Think of joining with thoughtful human beings around the world who would rather share this beautiful creation than destroy it with war and exploitation. I am happy to be an Indigenous presence on this voyage. Robert Lovelace is an adjunct lecturer at Queen’s University in the Department of Global Development Studies. His academic interests include Indigenous Studies, Sustainable Development and Aboriginal education. Robert is also an activist in anti-colonial struggles. In 2008, Robert spent 3 ½ months as a political prisoner for his part in defending the Ardoch Algonquin First Nation homeland from uranium exploration and mining. Robert is a retired chief of the Ardoch Algonquin First Nation. He lives in the Algonquin highlands at Eel Lake in the traditional Ardoch territory. 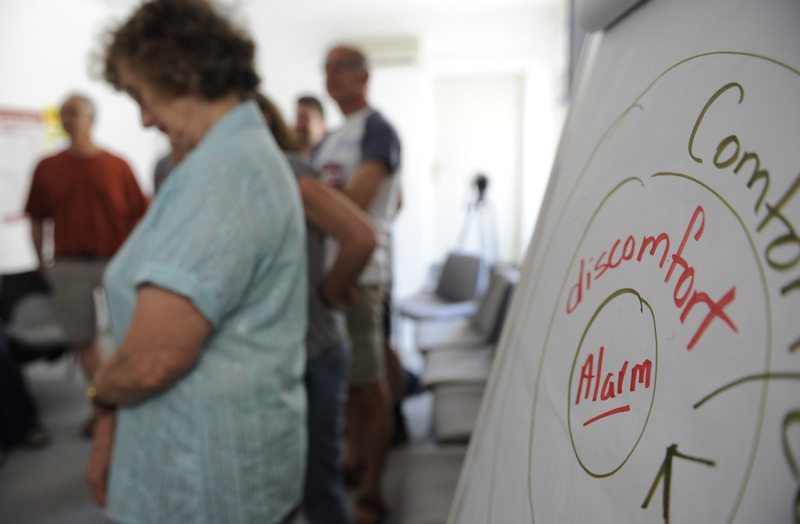 Well we are all here and started our scenario training today with a major focus on NVDA, our crew is incredibly diverse 6 nationalities – Australia, Belgium, Canada, Denmark, New Zealand and German – ranging in age from 30 to 70 years old – and from all walks of life. We have a former Belgium Senator, a 1st Nations Chief, lawyers, grand parents, software developers, students, journalists, activists including several that sailed on the Mavi in the last flotilla and not mention an impressive Australian contingent. All of whom are incredibly committed to NVDA and human rights – every where in the world not just in Palestine. There is already a strong bond amongst the crew, you could literally feel the love in the room – it was a beautiful thing to behold. Apart from the focus on NVDA we also ran through some possible scenarios, sabotage, being boarded, naval stand off, use of chemical weapons, being detained, etc… These where discussed in great detail and you could see the crew all processing these possibilities and while I think we are all intimidated, none of us will be deterred from answering the challenge the IOF made to the international solidarity movement by attacking the last flotilla. I have had a tour of Tahir and it looks like the money has been well spent. I feel like big Kev “I’m ECITED ! 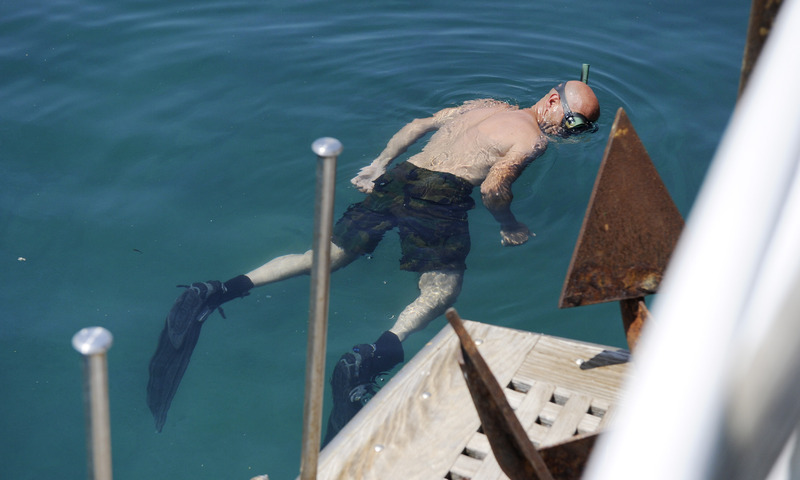 I am posing as a tourist and have keep up appearances pretty well swimming, eating, drinking and making new friends, although I am looking forward to the rest of the crew arriving today and tomorrow – as keeping our mission to myself is killing me. This is the biggest thing I have ever taken on and while it’s an honour and a privilege to be here, it has been an emotional roller coaster and I am looking forward to hanging out with others who are on the same ride. The contrast between where I am and where I am going is worlds apart. Where I am has electricity 24 hours a day, clean running water, working sewerage system, plentiful food supplies and an idyllic coast line. Where I am going has power cuts most days, polluted water supplies, no working sewerage system, 80% of the population reliant ion the UN for basic human needs like food and where a day at the beach can end in tragedy. This is my commitment to the people of Gaza, I and the rest of the international solidarity movement will not rest until normal life has been restored to Gaza and the differences between where I am and where I am going are only cultural – not life threatening ! We, the undersigned, are Australian citizens who will shortly be departing Australia to participate in the 2011 Freedom Flotilla 2 to break the blockade of Gaza. We will be joining a peaceful, non-violent sea convoy transporting humanitarian goods and messages of solidarity and goodwill to the besieged people of Gaza. We are participating in the Freedom Flotilla 2 because we believe the blockade of Gaza is contrary to international law and violates the human rights of Gaza’s civilian population, the majority of whom are children. 1. Israel is an occupying power that, since 2007, has exercised effective control over Gaza’s territorial waters, its airspace, and the flow of people and goods through its land borders. 3. The Government of Israel’s imposition and maintenance of the blockade is a disproportionate and non-targeted response to threats to Israel’s security that has resulted in the collective punishment of Gaza’s 1.5 million civilians, so much so that 80 per cent of the population are forced to rely on United Nations food assistance to survive, with malnutrition and poverty being widespread. 4. The Secretary-General of the United Nations, the UN Human Rights Council, the International Committee of the Red Cross, and numerous human rights organisations have all condemned the blockade as illegal and called upon Israel to lift the siege. 5. Governments are bound not only to uphold but also to act upon violations of international law and human rights treaties. The Australian Government has consistently failed to discharge its responsibility. 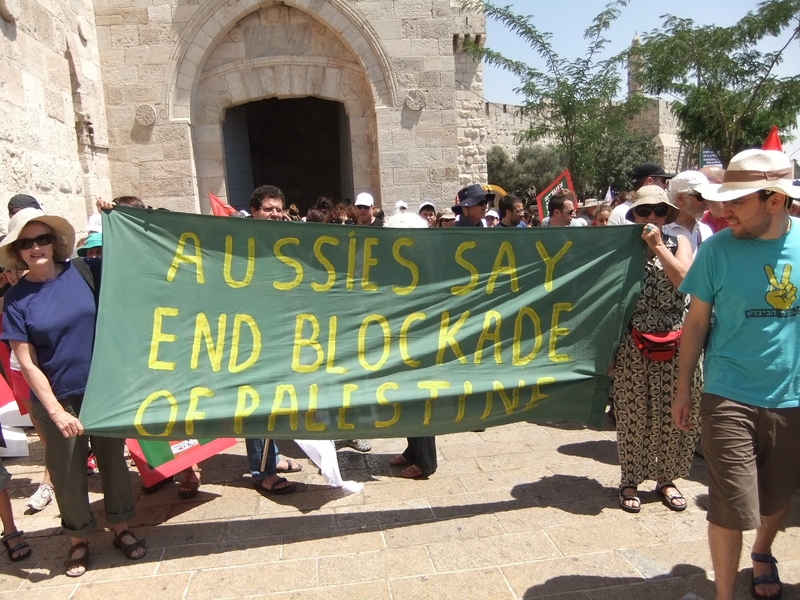 We are conscious that the silence of the Government of Australia and its failure to speak out against the blockade is tantamount to Australia condoning Israel’s callous disregard for the human rights of the citizens of Gaza and its refusal to comply with its international obligations. It is this silence that compels us as citizens of good conscience to act where our Government has so consistently failed to do so. We therefore call upon the Government of Australia to remind the Government of Israel of its obligations under international law and to demand the immediate cessation of the blockade. We are equally mindful, on the eve of our departure, of last year’s lethal assault in international waters on Freedom Flotilla 1 and the overwhelming condemnation of the Israeli Government’s actions. We note that nine civilians were killed, one Australian citizen was shot, and others were wounded, illegally detained and their personal possessions confiscated. We therefore call upon the Australian Government to exert its utmost influence to prevent a repetition of last year’s attack and to ensure the safety of all on board Freedom Flotilla 2. We reiterate that the Flotilla is a peaceful, unarmed convoy. We are committed to non-violence and will offer no active resistance should our vessel or the convoy be subject to attack. Our actions will at all times be lawful. We expect, therefore, to receive the full protections of the Australian Government should we be harmed or illegally detained when overseas. Michael Coleman, Sylvia Hale, Vivienne Porzsolt and Nick Wallwork.